← The chalk man mystery from the past! Written by William Hamilton Gibson, an American naturalist from Connecticut, this book is a lovely tribute to nature with illustrations by the author. But equally impressive is the book binding. 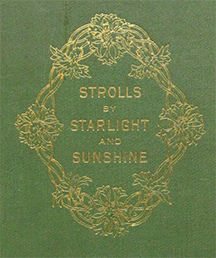 The book is bound in green cloth over boards with gold decoration by Alice Cordelia Morse. Morse was born in Ohio and studied at Cooper Union in New York and at Alfred University. She worked with both John La Farge and Louis Comfort Tiffany – well known designers of the period . Learn more about Morse and her life by visiting the Metropolitan Museum of Art’s timeline. Bookbinding techniques were perfected to a fine art toward the end of the 19th century. During the zenith of the American Decorative Arts Movement, something of an aesthetic crusade, women rose to the fore of book cover design. Alice Cordelia Morse (1863–1961) was a front-runner among the first generation of artists to design commercially produced books. The Grolier Club, an organization devoted to the art of the book hosted an exhibition on the life and work of Morse. Mindell Dubansky, preservation librarian in the Metropolitan Museum’s Thomas J. Watson Library was responsible for the research. She discovered Morse’s designs 10 years ago in a storage room of the Met’s Department of Prints and Drawings.